Photo shows what appears to be permafrost thaw ponds in Hudson Bay, Canada, near Greenland. (2008) Global warming will increase permafrost and peatland thaw, which can result in collapse of plateau surfaces. 2. Although climate sensitivity is usually used in the context of radiative forcing by carbon dioxide (CO2), it is thought of as a general property of the climate system: the change in surface air temperature following a unit change in radiative forcing, and the climate sensitivity parameter is therefore be expressed in units of °C/(W/m2). For this to be useful, the measure must be independent of the nature of the forcing (e.g. from greenhouse gases or solar variation); which is true approximately. When climate sensitivity is expressed for a doubling of CO2, its units are °C or equivalently K (Kelvin). Climate state describes a state of climate on Earth and similar terrestrial planets based on a thermal energy budget, such as the greenhouse or icehouse climate state. A greenhouse gas is a gas that absorbs and emits radiant energy within the thermal infrared range. Greenhouse gases cause the greenhouse effect. The primary greenhouse gases in Earth's atmosphere are water vapor, carbon dioxide, methane, nitrous oxide and ozone. Without greenhouse gases, the average temperature of Earth's surface would be about −18 °C (0 °F), rather than the present average of 15 °C (59 °F). The atmospheres of Venus, Mars and Titan also contain greenhouse gases. A tipping point in the climate system is a threshold that, when exceeded, can lead to large changes in the state of the system. Potential tipping points have been identified in the physical climate system, in impacted ecosystems, and sometimes in both. For instance, feedback from the global carbon cycle is believed to be a driver for the transition between glacial and interglacial periods, with orbital forcing providing the initial trigger. Earth's geologic temperature record includes many more examples of geologically rapid transitions between different climate states. 2 levels. Several climate models indicate that global warming through the 21st century could be accelerated by the response of the terrestrial carbon cycle to such warming. All 11 models in the C4MIP study found that a larger fraction of anthropogenic CO2 will stay airborne if climate change is accounted for. By the end of the twenty-first century, this additional CO2 varied between 20 and 200 ppm for the two extreme models, the majority of the models lying between 50 and 100 ppm. The higher CO2 levels led to an additional climate warming ranging between 0.1° and 1.5 °C. However, there was still a large uncertainty on the magnitude of these sensitivities. Eight models attributed most of the changes to the land, while three attributed it to the ocean. The strongest feedbacks in these cases are due to increased respiration of carbon from soils throughout the high latitude boreal forests of the Northern Hemisphere. One model in particular (HadCM3) indicates a secondary carbon cycle feedback due to the loss of much of the Amazon Rainforest in response to significantly reduced precipitation over tropical South America. While models disagree on the strength of any terrestrial carbon cycle feedback, they each suggest any such feedback would accelerate global warming. C4MIP (more fully, Coupled Climate Carbon Cycle Model Intercomparison Project) is a joint project between the International Geosphere-Biosphere Programme (IGBP)and the World Climate Research Programme (WCRP). It is a model intercomparison project along the lines of the Atmospheric Model Intercomparison Project, but for global climate models that include an interactive carbon cycle. Taiga, also known as boreal forest or snow forest, is a biome characterized by coniferous forests consisting mostly of pines, spruces, and larches. HadCM3 is a coupled atmosphere-ocean general circulation model (AOGCM) developed at the Hadley Centre in the United Kingdom. It was one of the major models used in the IPCC Third Assessment Report in 2001. Professor Chris Freeman is a British environmental scientist at the University of Wales, Bangor. Freeman is Professor of Aquatic Biogeochemistry in the College of Natural Sciences in Bangor. Freeman's research focuses on carbon cycling, with an emphasis on peatland carbon storage and dissolved organic carbon dynamics. His work is best known for its description of a mechanism known as the "peatland enzymic latch" and observation of a rising trend in aquatic dissolved organic carbon concentrations. His work has been recognised with awards from the American Society for Limnology and Oceanography and the Royal Society. Dissolved organic carbon (DOC) is the fraction of total organic carbon operationally defined as that which can pass through a filter size that typically ranges in size from 0.22 and 0.7 micrometers. The fraction remaining on the filter is called particulate organic carbon (POC). Peat, also known as turf, is an accumulation of partially decayed vegetation or organic matter. It is unique to natural areas called peatlands, bogs, mires, moors, or muskegs. The peatland ecosystem is the most efficient carbon sink on the planet, because peatland plants capture CO2 naturally released from the peat, maintaining an equilibrium. In natural peatlands, the "annual rate of biomass production is greater than the rate of decomposition", but it takes "thousands of years for peatlands to develop the deposits of 1.5 to 2.3 m [4.9 to 7.5 ft], which is the average depth of the boreal [northern] peatlands". Sphagnum moss, also called peat moss, is one of the most common components in peat, although many other plants can contribute. The biological features of Sphagnum mosses act to create a habitat aiding peat formation, a phenomenon termed 'habitat manipulation'. Soils consisting primarily of peat are known as histosols. Peat forms in wetland conditions, where flooding obstructs the flow of oxygen from the atmosphere, slowing the rate of decomposition. Peat, occurring naturally in peat bogs, is a store of carbon significant on a global scale. When peat dries it decomposes, and may additionally burn. Water table adjustment due to global warming may cause significant excursions of carbon from peat bogs. This may be released as methane, which can exacerbate the feedback effect, due to its high global warming potential. Desertification is a consequence of global warming in some environments. Desert soils contain little humus, and support little vegetation. As a result, transition to desert ecosystems is typically associated with excursions of carbon. Isaken et al. (2010)  considered how future methane release from the Arctic might contribute to global warming. Their study suggested that if global methane emissions were to increase by a factor of 2.5 to 5.2 above (then) current emissions, the indirect contribution to radiative forcing would be about 250% and 400% respectively, of the forcing that can be directly attributed to methane. This amplification of methane warming is due to projected changes in atmospheric chemistry. Schaefer et al. (2011)  considered how carbon released from permafrost might contribute to global warming. Their study projected changes in permafrost based on a medium greenhouse gas emissions scenario (SRES A1B). According to the study, by 2200, the permafrost feedback might contribute 190 (+/- 64) gigatons of carbon cumulatively to the atmosphere. Schaefer et al. (2011) commented that this estimate may be low. Uncertainty over climate change feedbacks has implications for climate policy. For instance, uncertainty over carbon cycle feedbacks may affect targets for reducing greenhouse gas emissions. Emissions targets are often based on a target stabilization level of atmospheric greenhouse gas concentrations, or on a target for limiting global warming to a particular magnitude. Both of these targets (concentrations or temperatures) require an understanding of future changes in the carbon cycle. If models incorrectly project future changes in the carbon cycle, then concentration or temperature targets could be missed. For example, if models underestimate the amount of carbon released into the atmosphere due to positive feedbacks (e.g., due to melting permafrost), then they may also underestimate the extent of emissions reductions necessary to meet a concentration or temperature target. Aerial photograph showing a section of sea ice. The lighter blue areas are melt ponds and the darkest areas are open water, both have a lower albedo than the white sea ice. The melting ice contributes to ice-albedo feedback. 1870–2009 Northern hemisphere sea ice extent in million square kilometers. Blue shading indicates the pre-satellite era; data then is less reliable. In particular, the near-constant level extent in Autumn up to 1940 reflects lack of data rather than a real lack of variation. Ice loss may have internal feedback processes, as melting of ice over land can cause eustatic sea level rise, potentially causing instability of ice shelves and inundating coastal ice masses, such as glacier tongues. Further, a potential feedback cycle exists due to earthquakes caused by isostatic rebound further destabilising ice shelves, glaciers and ice caps. As the temperature of a black body increases, the emission of infrared radiation back into space increases with the fourth power of its absolute temperature according to Stefan–Boltzmann law. This increases the amount of outgoing radiation as the Earth warms. The impact of this negative feedback effect is included in global climate models summarized by the IPCC. This is also called the Planck feedback. Following Le Chatelier's principle, the chemical equilibrium of the Earth's carbon cycle will shift in response to anthropogenic CO2 emissions. The primary driver of this is the ocean, which absorbs anthropogenic CO2 via the so-called solubility pump. At present this accounts for only about one third of the current emissions, but ultimately most (~75%) of the CO2 emitted by human activities will dissolve in the ocean over a period of centuries: "A better approximation of the lifetime of fossil fuel CO2 for public discussion might be 300 years, plus 25% that lasts forever". However, the rate at which the ocean will take it up in the future is less certain, and will be affected by stratification induced by warming and, potentially, changes in the ocean's thermohaline circulation. ↑ "Climate feedback IPCC Third Assessment Report, Appendix I - Glossary". ipcc.ch. ↑ Council, National Research (2 December 2003). Understanding Climate Change Feedbacks. nap.edu. doi:10.17226/10850. ISBN 9780309090728. ↑ "8.6.3.1 Water Vapour and Lapse Rate - AR4 WGI Chapter 8: Climate Models and their Evaluation". www.ipcc.ch. ↑ Stocker, Thomas F. (2013). IPCC AR5 WG1. Technical Summary (PDF). ↑ IPCC. "Climate Change 2007: Synthesis Report. Contribution of Working Groups I, II and III to the Fourth Assessment Report of the Intergovernmental Panel on Climate Change. Pg 53" (PDF). ↑ Cox, Peter M.; Richard A. Betts; Chris D. Jones; Steven A. Spall; Ian J. Totterdell (November 9, 2000). "Acceleration of global warming due to carbon-cycle feedbacks in a coupled climate model" (abstract). Nature. 408 (6809): 184–7. Bibcode:2000Natur.408..184C. doi:10.1038/35041539. PMID 11089968 . Retrieved 2008-01-02. ↑ Friedlingstein, P.; P. Cox; R. Betts; L. Bopp; W. von Bloh; V. Brovkin; P. Cadule; S. Doney; M. Eby; I. Fung; G. Bala; J. John; C. Jones; F. Joos; T. Kato; M. Kawamiya; W. Knorr; K. Lindsay; H.D. Matthews; T. Raddatz; P. Rayner; C. Reick; E. Roeckner; K.G. Schnitzler; R. Schnur; K. Strassmann; A.J. Weaver; C. Yoshikawa; N. Zeng (2006). "Climate–Carbon Cycle Feedback Analysis: Results from the C4MIP Model Intercomparison". Journal of Climate. 19 (14): 3337–53. Bibcode:2006JCli...19.3337F. doi:10.1175/JCLI3800.1. hdl:1912/4178. ↑ Schulze, E. Detlef; Annette Freibauer (September 8, 2005). "Environmental science: Carbon unlocked from soils". Nature. 437 (7056): 205–6. Bibcode:2005Natur.437..205S. doi:10.1038/437205a. PMID 16148922 . Retrieved 2008-01-02. ↑ Freeman, Chris; Ostle, Nick; Kang, Hojeong (2001). "An enzymic 'latch' on a global carbon store". Nature. 409 (6817): 149. doi:10.1038/35051650. PMID 11196627. ↑ Freeman, Chris; et al. (2004). "Export of dissolved organic carbon from peatlands under elevated carbon dioxide levels". Nature. 430 (6996): 195–8. Bibcode:2004Natur.430..195F. doi:10.1038/nature02707. PMID 15241411. ↑ "Science: Global warming is killing U.S. trees, a dangerous carbon-cycle feedback". climateprogress.org. ↑ Kvenvolden, K. A. (1988). "Methane Hydrates and Global Climate". Global Biogeochemical Cycles. 2 (3): 221–229. Bibcode:1988GBioC...2..221K. doi:10.1029/GB002i003p00221. ↑ Zimov, A.; Schuur, A.; Chapin Fs, D. (Jun 2006). "Climate change. Permafrost and the global carbon budget". Science. 312 (5780): 1612–1613. doi:10.1126/science.1128908. ISSN 0036-8075. PMID 16778046. ↑ Archer, D (2007). "Methane hydrate stability and anthropogenic climate change". Biogeosciences Discuss. 4 (2): 993–1057. doi:10.5194/bgd-4-993-2007. ↑ Ian Sample (2005-08-11). "Warming Hits 'Tipping Point'". Guardian. Archived from the original on 2005-11-06. Retrieved 2007-12-30. ↑ "Permafrost Threatened by Rapid Retreat of Arctic Sea Ice, NCAR Study Finds" (Press release). UCAR. 10 June 2008. Archived from the original on 18 January 2010. Retrieved 2009-05-25. ↑ Lawrence, D. M.; Slater, A. G.; Tomas, R. A.; Holland, M. M.; Deser, C. (2008). "Accelerated Arctic land warming and permafrost degradation during rapid sea ice loss" (PDF). Geophysical Research Letters. 35 (11): L11506. Bibcode:2008GeoRL..3511506L. doi:10.1029/2008GL033985. Archived from the original (PDF) on 2009-03-20. ↑ Connor, Steve (September 23, 2008). "Exclusive: The methane time bomb". The Independent . Retrieved 2008-10-03. ↑ Connor, Steve (September 25, 2008). "Hundreds of methane 'plumes' discovered". The Independent . Retrieved 2008-10-03. ↑ N. Shakhova; I. Semiletov; A. Salyuk; D. Kosmach; N. Bel’cheva (2007). "Methane release on the Arctic East Siberian shelf" (PDF). Geophysical Research Abstracts. 9: 01071. ↑ IPCC (2001d). "4.14". In R.T. Watson; the Core Writing Team. Question 4. Climate Change 2001: Synthesis Report. A Contribution of Working Groups I, II, and III to the Third Assessment Report of the Intergovernmental Panel on Climate Change. Print version: Cambridge University Press, Cambridge, U.K., and New York, N.Y., U.S.A.. This version: GRID-Arendal website. Retrieved 2011-05-18. ↑ IPCC (2001d). "Box 2-1: Confidence and likelihood statements". In R.T. Watson; the Core Writing Team. Question 2. Climate Change 2001: Synthesis Report. A Contribution of Working Groups I, II, and III to the Third Assessment Report of the Intergovernmental Panel on Climate Change. Print version: Cambridge University Press, Cambridge, U.K., and New York, N.Y., U.S.A.. This version: GRID-Arendal website. Archived from the original on 2011-06-04. Retrieved 2011-05-18. 1 2 Clark, P.U. ; et al. (2008). "Executive Summary" (PDF). Abrupt Climate Change. A Report by the U.S. Climate Change Science Program and the Subcommittee on Global Change Research (PDF). U.S. Geological Survey, Reston, VA. p. 2. Retrieved 2011-05-18. ↑ Clark, P.U. ; et al. (2008). "Chapter 1: Introduction: Abrupt Changes in the Earth's Climate System" (PDF). Abrupt Climate Change. A Report by the U.S. Climate Change Science Program and the Subcommittee on Global Change Research (PDF). U.S. Geological Survey, Reston, VA. p. 12. Retrieved 2011-05-18. ↑ Heimann, Martin; Markus Reichstein (2008-01-17). "Terrestrial ecosystem carbon dynamics and climate feedbacks". Nature. 451 (7176): 289–292. Bibcode:2008Natur.451..289H. doi:10.1038/nature06591. PMID 18202646 . Retrieved 2010-03-15. ↑ Ise, T.; Dunn, A. L.; Wofsy, S. C.; Moorcroft, P. R. (2008). "High sensitivity of peat decomposition to climate change through water-table feedback". Nature Geoscience. 1 (11): 763. Bibcode:2008NatGe...1..763I. doi:10.1038/ngeo331. ↑ Cook, K. H.; Vizy, E. K. (2008). "Effects of Twenty-First-Century Climate Change on the Amazon Rain Forest". Journal of Climate. 21 (3): 542–821. Bibcode:2008JCli...21..542C. doi:10.1175/2007JCLI1838.1. ↑ Enquist, B. J.; Enquist, C. A. F. (2011). "Long-term change within a Neotropical forest: assessing differential functional and floristic responses to disturbance and drought". Global Change Biology. 17 (3): 1408. Bibcode:2011GCBio..17.1408E. doi:10.1111/j.1365-2486.2010.02326.x. ↑ "Climate Change and Fire". David Suzuki Foundation. Archived from the original on 2007-12-08. Retrieved 2007-12-02. ↑ "Global warming : Impacts : Forests". United States Environmental Protection Agency. 2000-01-07. Archived from the original on 2007-02-19. Retrieved 2007-12-02. ↑ "Feedback Cycles: linking forests, climate and landuse activities". Woods Hole Research Center. Archived from the original on 2007-10-25. Retrieved 2007-12-02. ↑ Schlesinger, W. H.; Reynolds, J. F.; Cunningham, G. L.; Huenneke, L. F.; Jarrell, W. M.; Virginia, R. A.; Whitford, W. G. (1990). "Biological Feedbacks in Global Desertification". Science. 247 (4946): 1043–1048. Bibcode:1990Sci...247.1043S. doi:10.1126/science.247.4946.1043. PMID 17800060. ↑ Solomon; et al., "Technical Summary", TS.6.4.3 Global Projections: Key uncertainties , in IPCC AR4 WG1 2007. ↑ Isaksen, Ivar S. A.; Michael Gauss; Gunnar Myhre; Katey M. Walter; Anthony and Carolyn Ruppel (20 April 2011). "Strong atmospheric chemistry feedback to climate warming from Arctic methane emissions" (PDF). Global Biogeochemical Cycles. 25 (2): n/a. Bibcode:2011GBioC..25B2002I. doi:10.1029/2010GB003845. hdl:1912/4553. ↑ KEVIN SCHAEFER; TINGJUN ZHANG; LORI BRUHWILER; ANDREW P. BARRETT (2011). "Amount and timing of permafrost carbon release in response to climate warming". Tellus Series B. 63 (2): 165–180. Bibcode:2011TellB..63..165S. doi:10.1111/j.1600-0889.2011.00527.x. ↑ Repo, M. E.; Susiluoto, S.; Lind, S. E.; Jokinen, S.; Elsakov, V.; Biasi, C.; Virtanen, T.; Martikainen, P. J. (2009). "Large N2O emissions from cryoturbated peat soil in tundra". Nature Geoscience. 2 (3): 189. Bibcode:2009NatGe...2..189R. doi:10.1038/ngeo434. ↑ Simó, R.; Dachs, J. (2002). "Global ocean emission of dimethylsulfide predicted from biogeophysical data". Global Biogeochemical Cycles. 16 (4): 1018. Bibcode:2002GBioC..16d..26S. doi:10.1029/2001GB001829. ↑ Stocker, T.F. ; Clarke, G.K.C. ; Le Treut, H.; Lindzen, R.S. ; Meleshko, V.P. ; Mugara, R.K.; Palmer, T.N. ; Pierrehumbert, R.T.; Sellers, P.J. ; Trenberth, K.E. ; Willebrand, J. (2001). "Chapter 7: Physical Climate Processes and Feedbacks" (PDF). In Manabe, S.; Mason, P. Climate Change 2001: The Scientific Basis. Contribution of Working Group I to the Third Assessment Report of the Intergovernmental Panel on Climate Change (Full free text). Cambridge, United Kingdom and New York, NY, USA: Cambridge University Press. pp. 445–448. ISBN 978-0-521-01495-3. 1 2 Hansen, J., "2008: Tipping point: Perspective of a climatologist." Archived 2011-10-22 at the Wayback Machine , Wildlife Conservation Society/Island Press, 2008. Retrieved 2010. ↑ "Avoiding dangerous climate change" (PDF). The Met Office. 2008. p. 9. Retrieved August 29, 2008. ↑ Eric Steig; Gavin Schmidt. "Antarctic cooling, global warming?". RealClimate. Retrieved 2008-01-20. 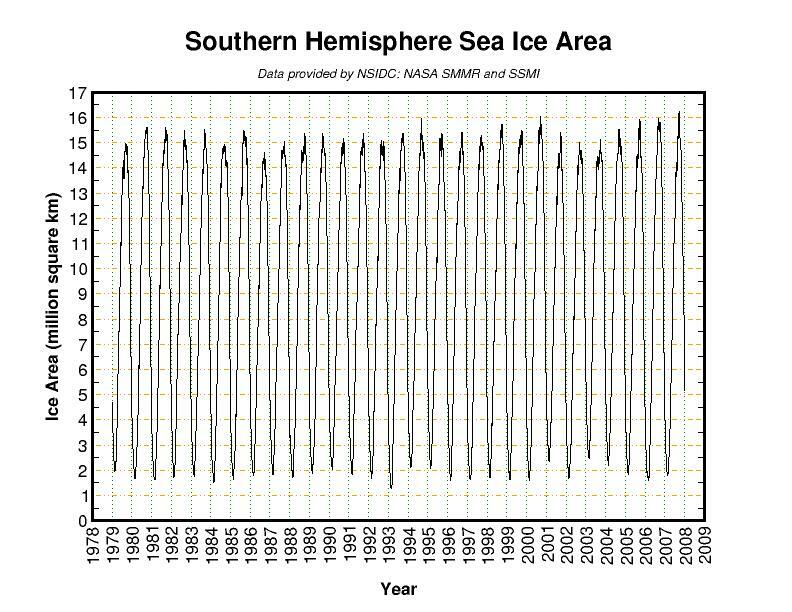 ↑ "Southern hemisphere sea ice area". Cryosphere Today. Archived from the original on 2008-01-13. Retrieved 2008-01-20. ↑ "Global sea ice area". Cryosphere Today. Archived from the original on 2008-01-10. Retrieved 2008-01-20. ↑ University of Virginia (March 25, 2011). "Russian boreal forests undergoing vegetation change, study shows". ScienceDaily.com. Retrieved March 9, 2018. ↑ "Science Magazine February 19, 2009" (PDF). Archived from the original (PDF) on 2010-07-14. Retrieved 2010-09-02. ↑ Yang, Zong-Liang. "Chapter 2: The global energy balance" (PDF). University of Texas. Retrieved 2010-02-15. ↑ Archer, David (2005). "Fate of fossil fuel CO2 in geologic time" (PDF). Journal of Geophysical Research . 110: C09S05. Bibcode:2005JGRC..11009S05A. doi:10.1029/2004JC002625. ↑ "The Carbon Cycle - Earth Science - Visionlearning". Visionlearning. ↑ "Prologue: The Long Thaw: How Humans Are Changing the Next 100,000 Years of Earth's Climate by David Archer". princeton.edu. Archived from the original on 2010-07-04. Retrieved 2010-08-09. ↑ Cramer, W.; Bondeau, A.; Woodward, F. I.; Prentice, I. C.; Betts, R. A.; Brovkin, V.; Cox, P. M.; Fisher, V.; Foley, J. A.; Friend, A. D.; Kucharik, C.; Lomas, M. R.; Ramankutty, N.; Sitch, S.; Smith, B.; White, A.; Young-Molling, C. (2001). "Global response of terrestrial ecosystem structure and function to CO2and climate change: results from six dynamic global vegetation models". Global Change Biology. 7 (4): 357. Bibcode:2001GCBio...7..357C. doi:10.1046/j.1365-2486.2001.00383.x. ↑ National Research Council Panel on Climate Change Feedbacks (2003). Understanding climate change feedbacks (Limited preview). Washington D.C., United States: National Academies Press. ISBN 978-0-309-09072-8. ↑ A.E. Dessler; S.C. Sherwood (20 February 2009). "A matter of humidity" (PDF). Science. 323 (5917): 1020–1021. doi:10.1126/science.1171264. PMID 19229026. Archived from the original (PDF) on 2010-07-14. Retrieved 2010-09-02. Global warming potential (GWP) is a measure of how much heat a greenhouse gas traps in the atmosphere up to a specific time horizon, relative to carbon dioxide. It compares the amount of heat trapped by a certain mass of the gas in question to the amount of heat trapped by a similar mass of carbon dioxide and is expressed as a factor of carbon dioxide. In geology, permafrost is ground, including rock or (cryotic) soil, at or below the freezing point of water 0 °C (32 °F) for two or more years. Most permafrost is located in high latitudes, but at lower latitudes alpine permafrost occurs at higher elevations. Ground ice is not always present, as may be in the case of non-porous bedrock, but it frequently occurs and it may be in amounts exceeding the potential hydraulic saturation of the ground material. Permafrost accounts for 0.022% of total water on Earth and the permafrost region covers 24% of exposed land in the Northern Hemisphere. It also occurs subsea on the continental shelves of the continents surrounding the Arctic Ocean, portions of which were exposed during the last glacial period. Radiative forcing or climate forcing is the difference between insolation (sunlight) absorbed by the Earth and energy radiated back to space. The influences that cause changes to the Earth’s climate system altering Earth’s radiative equilibrium, forcing temperatures to rise or fall, are called climate forcings. Positive radiative forcing means Earth receives more incoming energy from sunlight than it radiates to space. This net gain of energy will cause warming. Conversely, negative radiative forcing means that Earth loses more energy to space than it receives from the sun, which produces cooling. This article serves as a glossary of climate change terms. It lists terms that are related to global warming. The clathrate gun hypothesis is the popular name given to the idea that increases in sea temperatures or drops in sea levels can trigger a strong positive feedback effect on climate: first, warming causes a sudden release of methane from methane clathrate compounds buried in seabeds and seabed permafrost; second, because methane itself is a powerful greenhouse gas, temperatures rise further, and the cycle repeats. This runaway process, once started, could be as irreversible as the firing of a gun. The effects of global warming in the Arctic, or climate change in the Arctic include rising air and water temperatures, loss of sea ice, and melting of the Greenland ice sheet with a related cold temperature anomaly, observed since the 1970s. Related impacts include ocean circulation changes, increased input of freshwater, and ocean acidification. Indirect effects through potential climate teleconnections to mid latitudes may result in a greater frequency of extreme weather events, ecological, biological and phenology changes, biological migrations and extinctions, natural resource stresses and as well as human health, displacement and security issues. Potential methane releases from the region, especially through the thawing of permafrost and methane clathrates, may occur. Presently, the Arctic is warming twice as fast compared to the rest of the world. The pronounced warming signal, the amplified response of the Arctic to global warming, is often seen as a leading indicator of global warming. The melting of Greenland's ice sheet is linked to polar amplification. According to a study published in 2016, about 0.5 °C of the warming in the Arctic has been attributed to reductions in sulfate aerosols in Europe since 1980. This is a list of climate change topics. Global warming in Russia describes the global warming related issues in Russia. This includes climate politics, contribution to global warming and the influence of global warming in Russia. In 2009 Russia was ready to reduce emissions 20–25% from its 1990 emission levels by the year 2020. Arctic methane release is the release of methane from seas and soils in permafrost regions of the Arctic. While a long-term natural process, it is exacerbated by global warming. This results in negative effects, as methane is itself a powerful greenhouse gas. Temperatures in the Arctic region have tended to increase more rapidly than the global average. Projections of sea ice loss that are adjusted to take account of recent rapid Arctic shrinkage suggest that the Arctic will likely be free of summer sea ice sometime between 2059 and 2078. Various climate engineering schemes have been suggested to reduce the chance of significant and irreversible effects such as Arctic methane release. Regional effects of global warming are long-term significant changes in the expected patterns of average weather of a specific region due to global warming. The world average temperature is rising due to the greenhouse effect caused by increasing levels of greenhouse gases, especially carbon dioxide. When the global temperature changes, the changes in climate are not expected to be uniform across the Earth. In particular, land areas change more quickly than oceans, and northern high latitudes change more quickly than the tropics, and the margins of biome regions change faster than do their cores. Atmospheric methane is the methane present in Earth's atmosphere. Atmospheric methane concentrations are of interest because it is one of the most potent greenhouse gases in Earth's atmosphere. Atmospheric methane is rising. The 100-year global warming potential of methane is 28. That is, over a 100-year period, it traps 28 times more heat per mass unit than carbon dioxide and 32 times the effect when accounting for aerosol interactions. Global methane concentrations had risen from 722 parts per billion (ppb) in pre-industrial times to 1800 ppb by 2011, an increase by a factor of 2.5 and the highest value in at least 800,000 years. Its concentration is higher in the Northern Hemisphere since most sources are located on land and the Northern Hemisphere has more land mass. The concentrations vary seasonally, with, for example, a minimum in the northern tropics during April−May mainly due to removal by the hydroxyl radical. There are expected to be various long-term effects of global warming. Most discussion and research, including that by the Intergovernmental Panel on Climate Change (IPCC) reports, concentrates on the effects of global warming up to 2100, with only an outline of the effects beyond this. This article is about the physical impacts of climate change. For some of these physical impacts, their effect on social and economic systems are also described. The permafrost carbon cycle is a sub-cycle of the larger global carbon cycle. 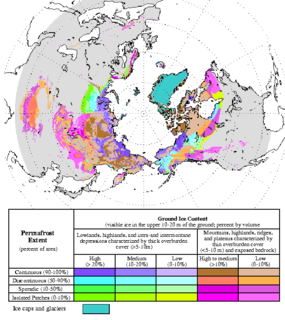 Permafrost is defined as subsurface material that remains below 0o C for at least two consecutive years. Because permafrost soils remain frozen for long periods of time, they store large amounts of carbon and other nutrients within their frozen framework during that time. Permafrost represents a large carbon reservoir that is seldom considered when determining global terrestrial carbon reservoirs. Recent and ongoing scientific research however, is changing this view. The soil carbon feedback concerns releases of carbon from soils, in response to global warming, known as a positive climate feedback. Soil carbon contains three times as much carbon as Earth's atmosphere, which makes them crucial to understand related carbon fluxes. However, other studies suggest that soils contain twice as much carbon than contained in the atmosphere. Measurements imply that 4 °C of warming increases annual soil respiration by up to 37%. Climate models do not account for effects of biochemical heat release associated with microbial decomposition. Tipping point: Perspective of a climatologist. In State of the Wild 2008–2009: A Global Portrait of Wildlife, Wildlands, and Oceans. W. Woods, Ed. Wildlife Conservation Society/Island Press, pp. 6–15.